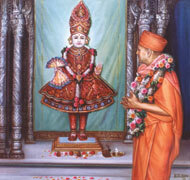 Jeevanpran Swamibapa installed the painted murtis of Lord Swaminarayan and Jeevanpran Bapashree in Maninagar Temple. However, the beautifully sculptured murti of Shree Ghanshyam Maharaj was still remained to be install here. Swamibapa enquired about the progress of sculpting the murti. It was being made in Jaipur and was nearly ready. So Swamibapa decided to hold the murti pratishtha on Aso sud 10, Vijya Dashmi. This day was fast approaching. There was a lot of work still to complete before the murti pratistha could take place; a new sinhasan had to be crafted, and more painted murtis needed to be made. Jeevanpran Swamibapa started all this preparatory work. He gave the work of creating a grand sinhasan to Shree Lallubhai and Chhaganbhai of Kadi. They carved an intricate wooden sinhasan, according to Swamibapa's instructions. A highly talented artist, Shree Ganpatbhai was commissioned to paint the other murtis, according to Jeevanpran Swamibapa's guidance. One day, Jeevanpran Swamibapa was travelling to Karjisan to meet Shree Vrundavandasji Swami. Swamibapa was deep in thought as he travelled on the back of a cart. He remembered all the hardships that the disciples had been subjected to. Jeevanpran Swamibapa became extremely emotional. All of a sudden, an intense lustre emerged from the sky and said, "Remove your sadness. You are not alone. Prepare for My arrival with enthusiasm and delight. I will arrive there, on Falgun sud 3." These were the words of Lord Swaminarayan. This made Swamibapa think. "Falgun sud 3? But the murti pratishtha is earlier, on Vijya Dashmi! Why did Shree Ghanshyam Maharaj say Falgun sud 3?" As Swamibapa deliberated about the Lord's words, Karjisan arrived. Swamibapa went for the darshan of Shree Vrundavandasji Swami. Swamibapa wanted to take this opportunity to invite Shree Vrundavandasji Swami to the murti pratishtha ceremony. However, Shree Vrundavandasji Swami asked him to postpone the ceremony because he was in discussions with 'elders' in the Sampradaya to resolve the unsettlement. Swamibapa obeyed Shree Vrundavandasji Swami's wishes and postponed the murti pratishtha to Falgun sud 3, the date that Lord Swaminarayan had said. A message arrived from Jaipur. The murti was ready and they were trying to send it by rail. The message said, "The murti is in a wooden case and is sitting on the platform of Jaipur Station waiting for a train. However, there are no trains running from here at the moment." The murti sat on the platform for a long time. Then, a senior official was re-located from Jaipur to Ahmedabad and a special train was run to carry the official and his belongings. By error, the large wooden case sitting on the platform was loaded onto the train with the official's luggage. 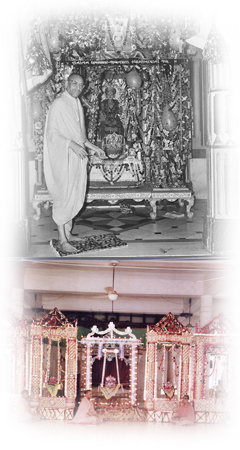 In this manner, Shree Ghanshyam Maharaj arrived in Ahmedabad on a special, first class, luxury train. At Ahmedabad Station, the guards read the name on the case and then sent a message to Maninagar Temple . They explained that it had been brought by mistake. The case was brought to Maninagar. 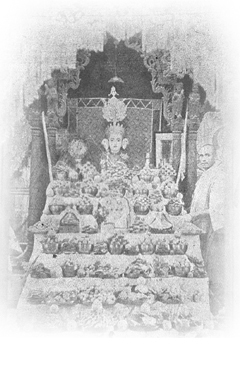 Jeevanpran Swamibapa opened the wooden casing. In it, was a beautiful crafted marble murti of Shree Ghanshyam Maharaj. In His own extraordinary manner, Shree Ghanshyam Maharaj had finally arrived. That day was Aso sud 10, Vijya Dashmi, the very day that Jeevanpran Swamibapa had first decided to perform the murti pratishtha. On Samvat 2000, Fagan Sud 3, Jeevanpran Swamibapa installed the divine murti of Lord Swaminarayan, Shree Ghanshyam Maharaj, Jeevanpran Bapashree and their Sankalpa Swaroops in Shree Swaminarayan Temple Maninagar, in accordance with the traditional ceremonial rites and the chanting of Vedic verses. It had been estimated that at most, a thousand people would attend the festival. The quantity of food was prepared accordingly. However, when the assembly sat down, it numbered three thousand. Jeevanpran Swamibapa walked amongst the seated assembly giving His divine darshan. He went to the kitchen and placed prasad in the prepared food. Then it was served. The more food that was served, the more the quantity of food seemed to increase. It was served again and again. The amount of food did not diminish at all. In this manner, Lord Swaminarayan and Jeevanpran Swamibapa showed their divine prowess to all. Jeevanpran Swamibapa had performed the historical task of installing the murtis in the Satsang's main temple - the centre of the Karan Satsang - Shree Swaminarayan Temple Maninagar. The fulfilment of Lord Swaminarayan's prophesy - "Gopal Muni! Novel feats will be performed through the fourth in your succession" - had begun. The words of Jeevanpran Bapashree - "We shall send you all a messenger from God. Through him, all will peacefully sing the glory of the Lord and attain Akshardham" - started to take meaning.